This entry was posted on April 12, 2019 by MAV Europe. Do you care for your feet? “Of course” will most probably be your first thought. But what exactly does “foot care” entail – and what tips can Ayurveda offer for beautiful, cared for feet? Foot care is much more than what we refer to as “pedicure”, i.e. soaking feet in warm water, cutting toe nails, removing hard skin, a cosmetic foot treatment and a coat of nail polish. Our feet are the foundation of our body. They carry us through our entire life. Therefore, we would like to pay some special attention to the topic of foot health and the importance of healthy feet for our body. In line with this, we will present our ayurvedic foot massage “Padabhyanga”, which unites body, spirit and soul in harmony, and we now look forward to offering the traditional “Kaash Wellbeing Bowl” for foot massages in our online shop. Almost 100% of infants are born with healthy feet. However, approximately 80% of adults have foot problems such as enlarged balls of the foot, hammer toes, corns, fallen arches, splay feet, flat feet or heel spurs. According to experts, unsuitable shoes, which we often start wearing from childhood on, play a great role in the development of these problems. It is indeed not a new discovery that wearing good, healthy footwear is no luxury – the earliest ayurvedic texts recommended wearing the “right” footwear. 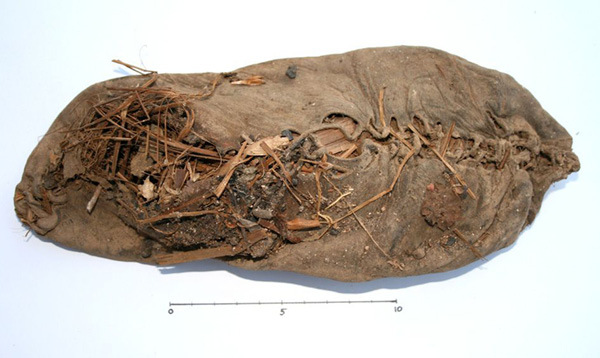 Of course, thousands of years ago there were no “high heels” or “high-tech” shoes around and that’s why we don’t find recommendations in ancient ayurvedic texts on how to fix problems that are triggered by fashionable shoes with high heels and insufficient space for toes. Let’s have a brief look at the impact high heels and too tight shoes have on our health. Pointy shoes immobilise the big toes, which should actually be part of the heel-to-ball movement of the foot. If active use of the toes is no longer possible in the rolling of the foot, the body adapts and only uses the middle and rear foot to carry your body weight. Often, this wrong weight-bearing of the foot remains undetected for a long period of time, sometimes even years. For, at the beginning, this only causes limited pain. The foot adapts. But the toes deform, they take on the shape of the frequently worn pointy shoes; this results in weakening of the foot and muscle loss - and problems are inevitable. Make sure that your shoes provide sufficient space for your toes. For our feet are actually shaped asymmetrically: they are wide at the front and narrow at the back. Most shoes don’t resemble the anatomy of our feet whatsoever. A shoe should not restrict your foot and have no heel (= zero heel). It should have a thin sole, and also allow your big toe to have contact with the ground, so that it can work as if it were bare, ensuring that the muscles and foot arch are used and exercised. It is therefore best to only wear shoes with high heels on rare occasions. A tip for the ladies: Take your “high heels” with you to events or parties, but only wear them for short periods. If the heel of your foot is higher, compared to your forefoot, this is called “heel pitch”. This has an unhealthy impact on our body posture: We tilt forwards and - in order to maintain our equilibrium – compensate this with movements in the knee, hip and spine. We form a hollow back. This alone causes various joint and back pains. Did you know that? By the way, this is already the case with very low heels (even for ballerina pumps) – and of course much more severe in shoes with high heels. Try to walk barefoot as often as you can and enjoy the wonderful feeling. Of course, this is not always an option in everyday life. In this case, “barefoot shoes” are a great alternative, provided there are no health reasons that speak against this. We have tested a few models – and found them good. Nowadays, chic and elegant barefoot shoes are on the market (for example from ZAQQ, Vivobarefoot and Joe Nimble). Caution: At first wear your barefoot shoes only for short periods of time. Due to cushioning, pronation supports, inlays etc., your foot is probably no longer used to this unusual exposure. Most people’s feet muscles are impaired, or no longer function properly, due to insufficient movement, wrong shoes etc. The good news: These muscles – just like all muscles – can be exercised. Booking a personal coaching or participation in a workshop, for example at a barefoot school is ideal. Here you learn how to use your natural foot function again, and how foot malpositions affect your body. You learn “right” standing, walking and running. Exercises and instructions based on an individual foot analysis will help strengthen your feet and increase their mobility and sensory functions. Also, foot exercises with special balls, fascia rollers or straps are highly recommended. A vast and good selection of instructions is also available on YouTube. At Maharishi Ayurveda Europe we find this topic so exciting that we will hold this year’s annual company outing at a Dutch “Barefoot Park”. Maybe this is a tip for your next excursion with family or friends? If you already suffer from ailments such as Hallux Valgus, hammer toe etc, you might want to think about getting a toe spreader. If you do, good quality is paramount. We can recommend “Correct Toes”, which are marketed as “Happy Toes” in Germany. These high-quality toe spreaders correctly align your toes, provide stability and balance, and strengthen your toe and foot muscles. The need to look after the wellbeing of our feet is certainly not new knowledge. Ancient Ayurveda also knows how important the feet and their care are for our health. One of the most precious ayurvedic massages is “Padabyanga”, a wonderful, therapeutic foot massage. This massage is a vital part of a Panchakarma course of treatments. But you can also enjoy the relaxing effects at home, and do a lot for beautiful, cared for feet. Take a little time, ideally before going to sleep, and massage the soles of your feet with (warm) oil. 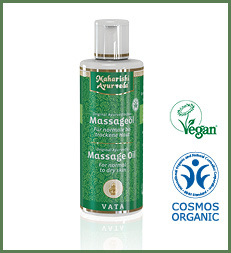 Vata Massage Oil is particularly well suited for an evening foot massage. Massage the feet with gentle, long, spreading out and circular movements, also including the calves. After a few minutes you will experience the relaxing effect and an increase in your well-being. Massaging your feet in the evening helps with insomnia, stress, nervousness and anxiety and also stimulates the “Marma points” of the feet, the sensitive vital points. 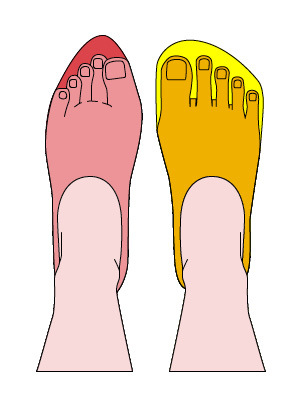 By the way, the main Marma points on the foot are located between the toes, and the “heart of the foot” is just above the middle of the sole of the foot. Tip: Before your massage, treat yourself to a 10-minute warm foot bath. Dry feet thoroughly. We have recently added a Kaash massage bowl, a harmonising well-being bowl for your foot massage. Foot massages using the Kaash bowl and ghee are traditionally common in many parts of India, particularly as a mean to relax before bedtime. 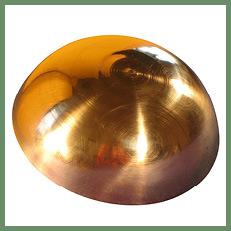 The name “Kaash” stands for a special blend of metals: its most important components are copper and zinc. The Kaash massage bowl looks like a small singing bowl and fits into one hand. Its smooth surface on the inside and outside gives the foot massage an unusually smooth and soft quality. We are happy to offer you this traditional massage bowl. Each bowl is handmade and shipped in a cotton bag that includes instructions on how to use it. A foot massage using the Kaash massage bowl is suitable at any time of day. Because of its relaxing effect on body and soul, we highly recommend that you use it before going to bed. We hope we have been able to contribute a little to your foot health with our suggestions and that you will continue to walk through life with happy feet.